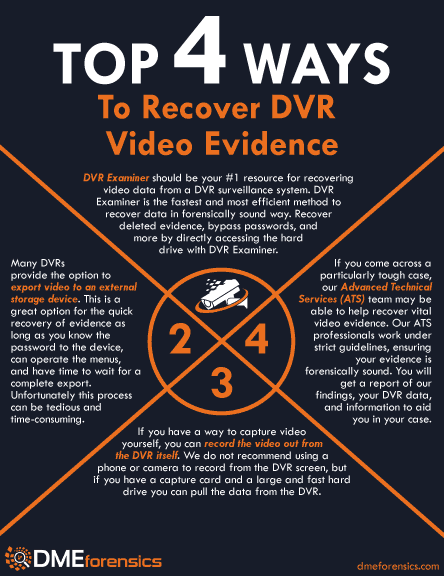 Top 4 Ways to Recover DVR Video Evidence - DME Forensics Inc.
One of the best resources available to you at a crime scene is the video footage found within nearby surveillance cameras. Whether you are a Crime Scene Investigator, a Detective, or a Digital Forensics Specialist… knowing how to properly and safely recover video from DVR surveillance is vital to the success of your investigation. There are four main ways to recover DVR surveillance footage, both on-scene and back in your crime lab. DVR Examiner is the fastest and most effective method to recover video evidence from a surveillance DVR. You can use DVR Examiner by connecting your computer directly to the DVR hard drive in a write-protected manner. This method bypasses all menus and passwords, even identifying inaccessible data on the hard drive. This process is done in a forensically sound manner, and all of the video received is exactly what was originally on the hard drive. NOTE: Always remember to contact us if you find a DVR filesystem that is not yet supported by DVR Examiner. We are always working to provide new filesystem updated to the program and we need your assistance to determine which filesystems are high priority. Send us an email at support@dmeforensics.com to report a found filesystem.